This book develops a new framework for analyzing the spatio-temporal workings of law and other forms of governance. 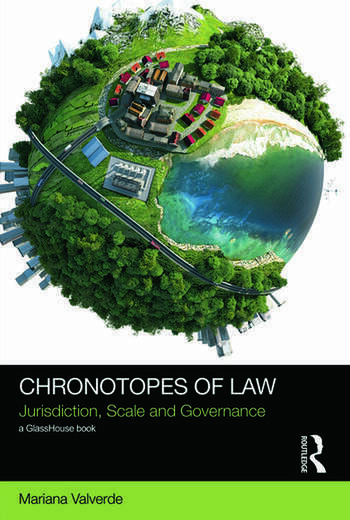 Chronotopes of Law argues that studies of law and governance can be reinvigorated by drawing on a bundle of quite heterogenous analytical tools that do not have a single provenance or a single political or normative aim but that work well in combination. Analyses of legal temporality carried out by anthropologists and studies of law and space undertaken by geographers and legal scholars have proliferated in recent years, but these research traditions have remained largely separate. By adapting notions such as intertextuality, dialogism, and the ‘chronotope’ from Mikhail Bakhtin, notions designed specifically to synthesize considerations of space and time in a framework that is open-ended, interactive and dynamic, Mariana Valverde develops an anti-metaphysical theory and method for legal studies. This approach will be useful both to theorists and to researchers seeking to illuminate the actual workings of law and other forms of governance. Indeed, a key aim of the book is to break down the institutional and disciplinary barriers that prevent theorists from learning from empirical studies and viceversa. Written by one of the foremost sociolegal scholars writing today, this theoretically innovative work constitutes a major contribution to contemporary studies in law and society. Mariana Valverde is Professor at the University of Toronto’s Centre for Criminology and Sociolegal Studies.